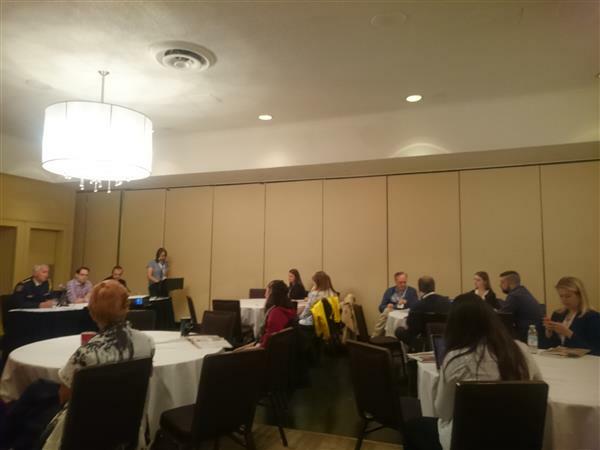 Good morning from Day 2 of #CAJ15. I'm CAJ community manager Carl Meyer, I'll be liveblogging today's session on "dealing with authority" with Liam Hyland, CTV News videographer; Dan Arsenault, Halifax Chronicle-Herald; and Deputy Chief Bill Moore, Halifax Regional Police. 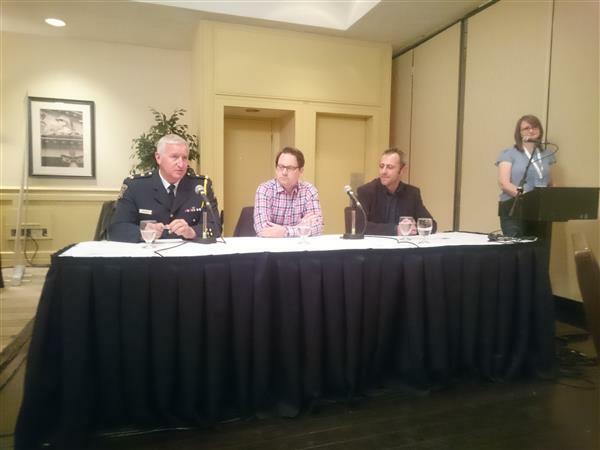 Remember to use #CAJ15 and the session-specific hashtag is #CAJ15cops. We're talking about the Valentine's Day Halifax gun plot. Liam talks about the lockdown in Boston, where he says in front of a hotel he walked out, there were military with M16s. At the end of the day, he says, if an authority figure tells you no-go, then that's that. You must retain your relationship, while still doing your job. Bill says in a perfect world, everyone would be happy, obviously that's not going to be the case. There's been discussion about the "immediacy of media" potentially affecting police tactics, at for example a stakeout where there's a live stream of police moving in. Bill relates a story about police communication strategy after learning about the kids with slingshots during the Valentine's Day incident. Typically they would wait to draft a press release, he says, but because they saw social media attention building, they decided to push it out quicker. Communication is taking a higher priority now, Bill says. All of the watch commanders are media trained, but when they need to take control of the situation they will assign media responsibility to another officer. Audience question about Halifax police moving to encrypt their communications. Bill says before, listening on a scanner, you had the same information as the sergeant sitting at the office. He says it wasn't a move against media necessarily. Question from the audience on the odd situation around the publication ban on Rehtaeh Parsons’s name. Bill brings up the ministerial directive that said no breach of the ban will be prosecuted unless in a derogatory way. Dan talks about getting information from the police in cases of police conduct. "Usually I know what I can get." Things like, why were you called to this scene, when did you arrive, who called you. Whenever someone contacts him about police conduct, he says, he also wants to find out as much as he can about them. Liam talks about covering Ferguson and the police using military-style equipment. It's a "real fine line" with journalists' responsibility to get the information out, he says. There are "bullies with badges, but there are also bully journalists." I can't imagine what the police go through, Liam adds; I couldn't imagine pulling a gun on someone. Journalists should have to do their due diligence too, he argues. After Ferguson, are we going to send a satellite truck out to every police shooting now? Bill says a major issue in the US now is an erosion of trust. Police derive their power not from law, but from the trust placed in them by the community, he argues. Question from the audience on whether there's a way to avoid mass arrests of journalists at a protest. We've seen this in Ferguson, we've seen this in Toronto. How do we avoid this? First Bill says he can't think of a time when a journalist was arrested in Halifax. There was one, Dan interjects (I can't find the link right now.) Then Bill says, if there are illegal arrests, officers should be held accountable. Question from the audience on police accommodating reporters at scenes. Liam says it's all in the approach; if you confront police in a standoffish way, you can expect them to have their back up. It's not compromising your moral integrity to be nice to a police officer. Bill says the cops are just concerned about safety and contaminating evidence. Dan says it's a pressure-cooker issue; editors demanding more information, reporters wanting to get the edge over competition, the fluid situation that's hard to predict. That's a wrap. Thanks to the panel, the audience and everyone watching online. Remember you can get all liveblogging links to all sessions at the calendar.